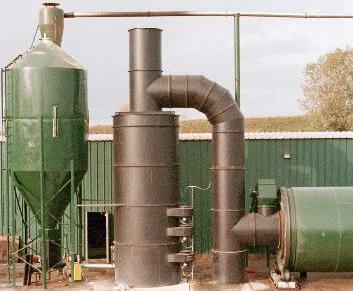 Jackson has been involved in the drying of wood shavings since 1979. In that time, we have seen a number of different methods employed, with varying degrees of success. Our experience has shown that the most cost-effective and efficient method for drying wood shavings is the use of triple-pass drum dryers(click for Brochure), such as those pioneered in the 1920s by the Arnold Dryer Company of Milwaukee (later a division of the Heil Co.). New drum dryers are now built by Baker-Rullman Mfg. and others, and reconditioned used units are also a popular and economical option when available. This simple, direct, and highly effective method of drying has been successfully applied in the dehydration of a wide range of materials; and has proved to be the ideal method for drying shavings. The drying drum features an expanding cross-sectional area and a compound showering flight pattern which guarantees maximum exposure of all particles to the drying medium. The velocity and temperature of the air stream are different in each of the three passes to suit the changing rates of evaporation as the moisture content of the shavings decreases. Material moves through the triple-pass drum in an air stream created by the dryer fan. The three cylinders are concentric and are mechanically interlocked to rotate at the same speed. The shavings are repeatedly carried to the top of each cylinder by internal and external flights so they are constantly and intimately showered through the hot gas. Moisture is given off continually as they move along the hot air stream. Precise control of exhaust air temperature assures accurate moisture control, without product degradation. Controls react instantaneously to any temperature change, and immediately adjust the BTU input to assure uniform drying and accurate control of the moisture content of the finished product. 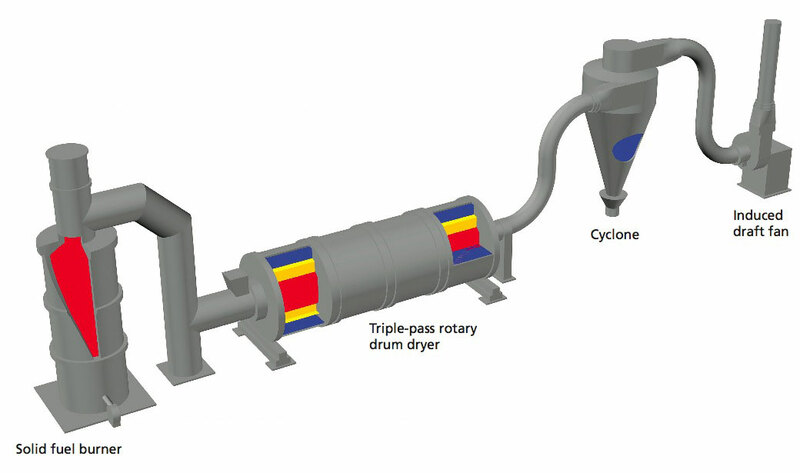 If the product is fragile, a "negative air" system may be used, where an airlock is installed at the bottom of the primary cyclone collector and the induced draft fan is positioned downstream to avoid product breakup caused by passing through the fan. However, we do not recommend this arrangement with certain species of wood, since we have found that resins present in the warm damp exhaust can quickly accumulate on the sidewalls of the pipe and plug it, making for a difficult cleaning job. They are substantially more economical to operate when fuel costs are taken into account. Fuel savings of 80% to 99.5% are not uncommon. They are very environmentally friendly; generating virtually no polluting emissions, and producing no net gain in the "greenhouse" gases associated with global warming. They help alleviate needless depletion of limited fossil fuel reserves and reduce dependence on foreign petroleum. Jackson has been a leader in the wood shaving industry for over 40 years. In that time, we have manufactured over 200 wood shaving mills, and have worked with many customers over the years to set up entire shaving plants. We bring this unparalleled depth of experience to every customer -- whether building one of our smallest shaving mills for a one-man owner/operator just getting started, or designing, installing, and starting up a complete plant layout "from scratch." Provide startup assistance and training of your employees. Afterward, we follow up to make sure everything is right, and provide on-going support for replacement parts and service work if necessary. We would be happy to discuss your project -- simply give us a call at (715) 926-3816, or see the "Contact Us" page. Click on logos to view websites. The Jackson logo and name , "Lumber Harvester", "Big Jack", "Premier Scragg Mill", and "Jackson Wood Shaving Mill"are registered trademarks of Jackson Lumber Harvester Co., Inc.
"Webb Burner" is a registered trademark of Energy Control Engineering, Inc. and is used under license. All other trademarks are property of their respective holders, and are hereby acknowledged as such. Copyright ©2000-2015 Jackson Lumber Harvester Co., Inc. All Rights Reserved.